OK, it wasn’t really madness. 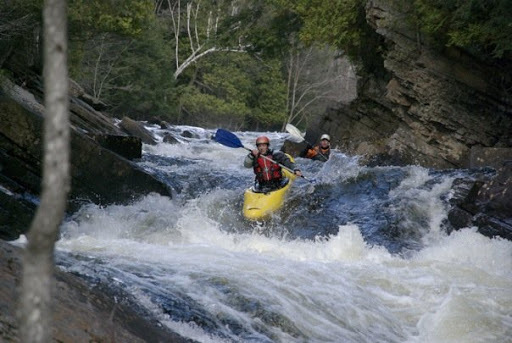 After a crazy Halloween keg party, 12 of us loaded up cars and drove north to check out Ragged Falls and the Oxtongue. We spent quite some time checking out the falls and discussing possible lines before a long hike and then a quick drive over to the Oxtongue. This was a short little run, but with a couple of steep class IV’s. The level now was a great introductory level for me, but it gets much better a little bit higher. Cale and I geared up and the rest drove down to take photos and watch. The biggest drop was a long one, non-stop with multiple moves. We had to scramble down the shore to check out each section, it wasn’t very boat-scoutable. I was a little nervous at first, as I get when I run anything new, but felt comfortable that the run was going to go well. I am still working on learning and improving these technical skills that you don’t gain spending all of your time on the Ottawa River big water. I’m excited to announce that I am getting better; on the Ottawa it didn’t matter if you flipped. Here, however, it mattered a lot! I got to try out all sorts of new gear today, my new creektop (which was very comfortable with great range of motion, considering), my new rescue vest, and my new H2O riverrunning paddle (a little longer than my play paddle with the riverrunner blade – powerful!). Photos by Rich and John Hevesi!